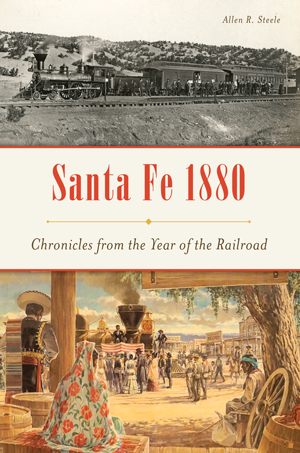 The sleepy frontier capital of Santa Fe transformed abruptly in 1880. The city, already a vibrant mix of cultures, jolted suddenly into the industrial age when it was inundated with hordes of newcomers from the East. The freshly laid tracks of the Atchison, Topeka and Santa Fe Railway provided easy access to the Wild West and changed the city almost overnight. Learn about the daily lives and surprising adventures of its local inhabitants, including Sisters of Charity challenging the establishment, Buffalo Soldiers pursuing an Apache chief across the desert and Billy the Kid’s escape from prison. Author Allen R. Steele recounts these events and more from firsthand accounts of that dynamic year. Dr. Allen R. Steele has spent his life in communication media, first at his college radio station and then moving up to international broadcasting networks. He also spent many years as a university professor in Australia and America. More recently, he has immersed himself in the history of the Southwest and has written many books, including The French Pilot. He now resides in Santa Fe and enjoys sharing the city’s history with visitors on his downtown history tours.